Ah, Fenty Beauty. The brand of the moment. The day the line was released, it was all I saw on social media. Though there's quite a few things in the collection to choose from, I decided to opt for one thing before shelling out wads of cash without reading reviews first on them first. 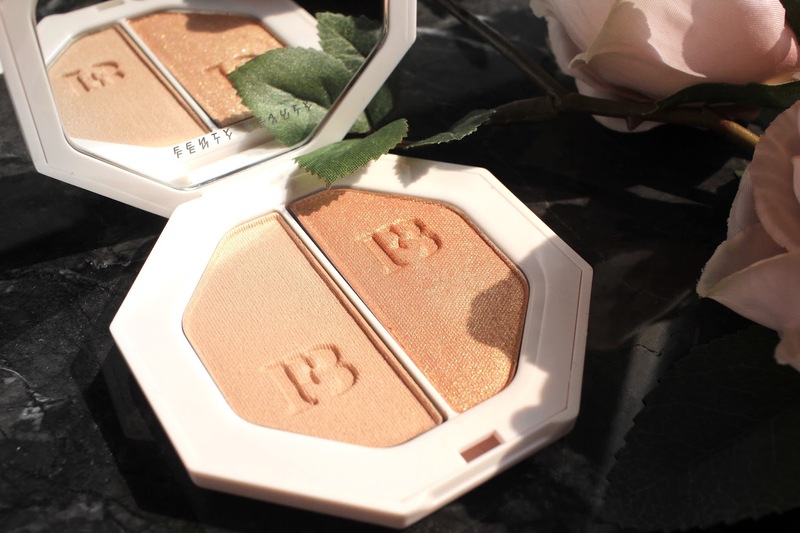 The product that caught my attention and was added to my basket within seconds was Rihanna's Killawatt Freestyle Highlighter in Mean Money/Hu$tla Baby. Despite the popularity of the shade Trophy Wife, which is described as a 3D hyper-metallic gold, I went with this duo as it looked more appealing to me. However, I may just end up buying Trophy Wife in the near future because of how different it looks. I absolutely love the idea of duo pans. I already know this is going to be taken along with me whenever I need to travel as I definitely can't have enough highlight options. I also really like that the packaging is lightweight and minimal; the design is sleek and I appreciate that it's not something that'd get dirty or stained easily. Now let's get into the actual product deets.. As I mentioned, I picked up the shade Mean Money/Hu$tla Baby. When I first swatched this, I was a little underwhelmed. 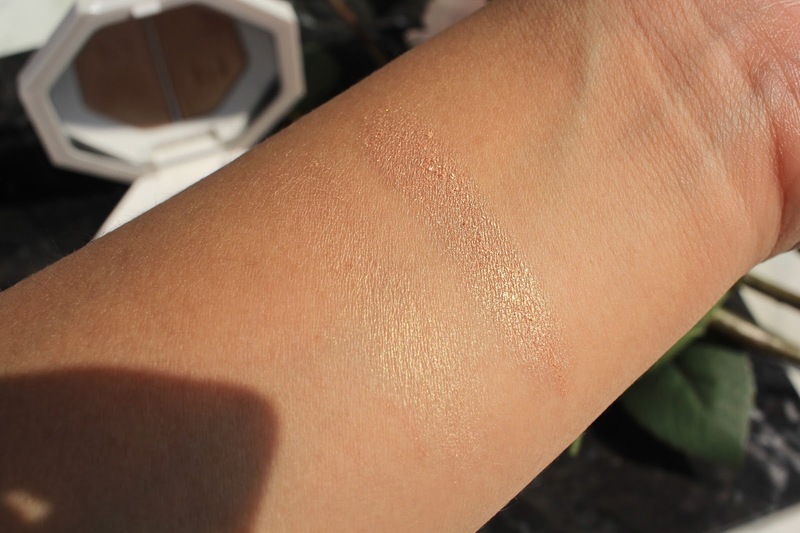 Though Hu$tla Baby swatched amazingly, Mean Money did not match the same tier. And I'm sure you can agree with me by the swatches down below. But still, I didn't automatically give it a thumbs down. I decided to actually wear it on my face before I made my final thoughts on it. I opted to wear Mean Money first. As expected, it looked beautiful on the skin. It gave me a glow so powerful that I was surprised to hear compliments from, from people at work. Some powder highlighters can look chalky on the skin, but this one didn't look it at all. It gave the kind of look that looks like skin, but you know it's highlight. If you're one of those people who wants to blind someone with your highlight, this was made for you! Though what surprised me was Hu$tla Baby. In my head, I already predicted that this was going to be a dud shade, however I was extremely surprised to like it just as much as I did the other shade. This is completely different to any other highlighter I've tried. Despite it taking quite a bit of layering to achieve my desired glow, this one makes it look like it's your actual skin that is glowing; like your own skin has it's own natural glow. I'm glad I decided to hold my tongue about it until after I tried it because I'm definitely satisfied by both shades. It's safe to say it's very much likely that I will be trying more bits from Fenty Beauty - I already have my eye on the Pro Filt'r Foundation & Gloss Bomb Lip Luminizer. Did you pick up anything from Fenty Beauty?